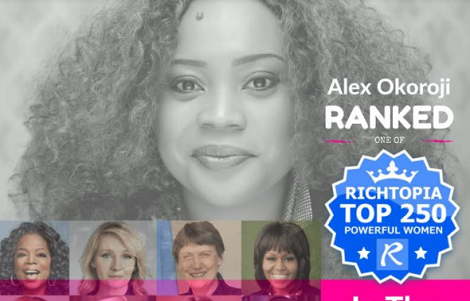 The daughter of the Chairman, Copyright Society of Nigeria (COSON) and CEO, TOPS, Chief Tony Okoroji has congratulated his first daughter, Alex Okoroji who was recently listed as one of the top 250 most influential women in the world by Richtopia, the world-renowned UK based digital platform famous for their global lists. The widely followed writer and International Digital Talk Radio Host famous for ‘The Naked Talk’ is currently ranked as the No 163 most influential woman in the world. Currently at No1 is the American Democratic Presidential candidate, Hilary Clinton, Michelle Obama is at No 6 while German Chancellor Angela Merkel is at no 18 and British Prime Minister, Theresa May is currently at No 22. Media personalities in the list include the author, J.K. Rowling at No 3, Oprah Winfrey at No 4, Ellen Degeneres at No 20 and CNN’s Christiana Amanpour at No 28. Three other Nigerian women made the list. They are Oby Ezekwesili at 93, Ngozi Okonjo Iweala at 156 and Abike Dabiri at 161. Sir no trend for 2017 neco runs? Or does it mean no neco runs will take place? Am realy in need of it.